Poynton Round Table is making donations totalling over £26,000 to local charities, good causes and groups. Following a very successful and well-attended 2016 Poynton Bonfire and thanks to the generous donations to the annual Santa float, Poynton Round Table have been able to make over 40 donations totalling in excess of £26,000. 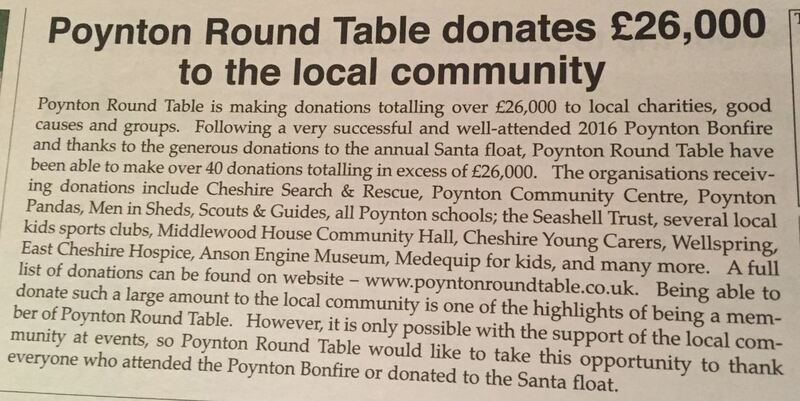 Being able to donate such a large amount to the local community is one of the highlights of being a member of Poynton Round Table. However, it is only possible with the support of the local community at our events, so we would like to take the opportunity to thank everyone who attended the Poynton Bonfire or donated to the Santa float. In 2016 Poynton Round Table donated £17,000 to local charities, groups, and good causes. In addition to the early (December 2015 - see below) donation of £8000 made to Poynton Community Centre the following organisations received donations from Poynton Round Table. Following a successful ﻿Charity Bonfire and Fireworks display﻿, Poynton Round Table is delighted to have donated £8000 to the Poynton Community Centre for their “SAVE Your Centre” appeal. The appeal has been raising money for essential improvements and repairs to Poynton’s oldest and best loved buildings. The Poynton Community Centre is the focal point for so many great community events in Poynton, but required £25,000 of essential repairs and improvements to bring it up to current standards. Poynton Round Table is pleased to be able to help bring this building back to life and its rightful place at the centre of the community. 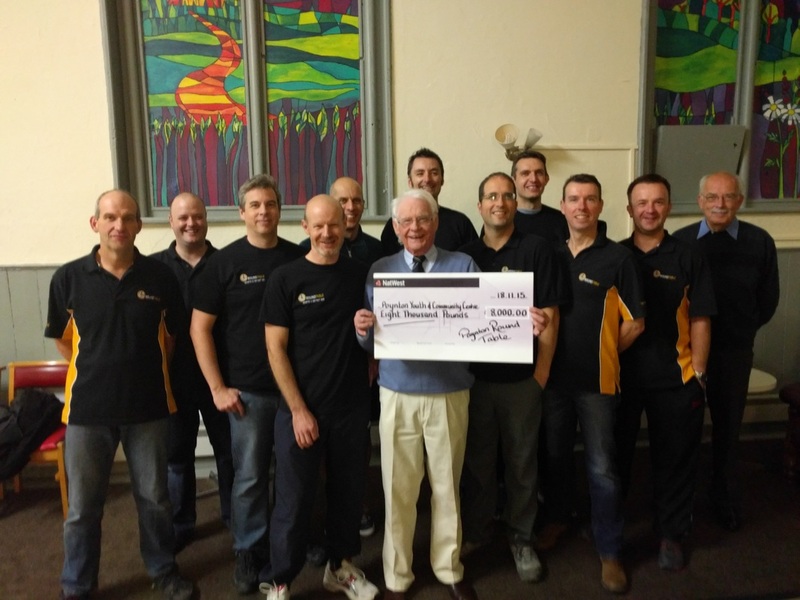 Pictured below are members of Poynton Round Table presenting the cheque for £8000 to the Poynton Community Centre trustee Geoff King. Chairman of Poynton Round Table David Maiden commented “from the first meeting with Geoff King and John Shaw it was clear that the energy and enthusiasm being poured into the centre was going to make a big difference, we had no hesitation in selecting the Centre as our Headline Charity this year”, whilst Geoff King Chairman of Poynton Community Centre said “to say thank you to Poynton Round Table for their support seems inadequate. This donation will kick start Phase II of the restoration. On behalf of the trustees and the people of Poynton a sincere thank you to you all". Poynton Round Table will be making additional donations to local charities, groups and good causes over the next few months. Following the success of the 2014 Bonfire we made an early donation in December 2014 of £10,000 to our Bonfire Headline Charity East Cheshire Hospice. We have more to donate in early 2015 from the Bonfire and December Santa rounds. Earlier in 2014 we donated over £6000 to local charities, clubs, associations and good causes in Poynton and the surrounding areas! 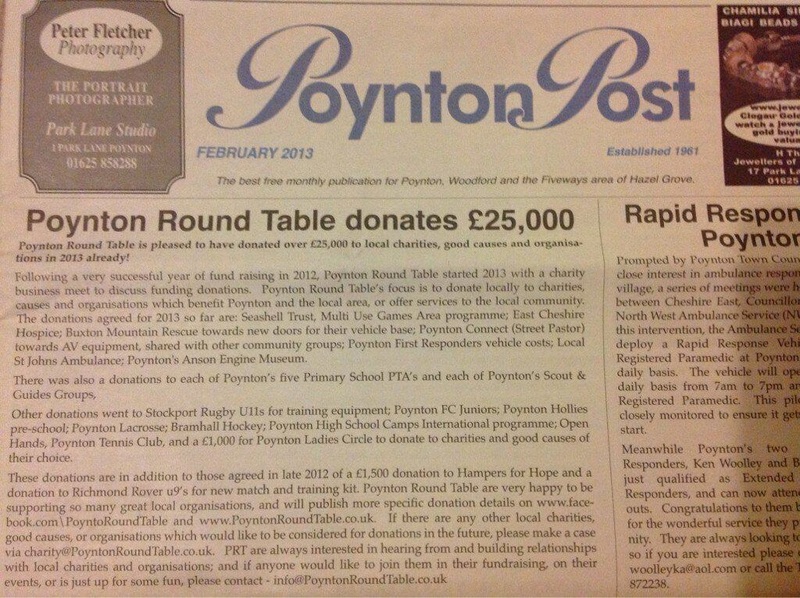 During 2013 Poynton Round Table donated over £28,000 to charities, clubs, associations and good causes in Poynton and the surrounding areas. We are proud to support our local community; after all, the money we raise comes from the community as a result of our Bonfire and Fireworks event as well as the Christmas Santa Rounds. In fact over the last 10 years we have raised and donated in excess of £100,000 to local charities, clubs, associations and good causes .